A $500 m (£385 m) warship has almost completely sunk to the bottom of a Norwegian fjord after smashing into an oil tanker off the coast of the Scandinavian country. KNM Helge Ingstad, a 5,290 ton frigate, was on an exercise in Hjeltefjord near Bergen when it collided with a Maltese flagged oil tanker in the early hours of 8 November. “Due to the damage to the frigate, it was moved to a safe place,” Nato’s Allied Maritime Command said in a statement issued after the accident. But the cables holding the wrecked vessel snapped this week, dramatically ending efforts to secure the ship. 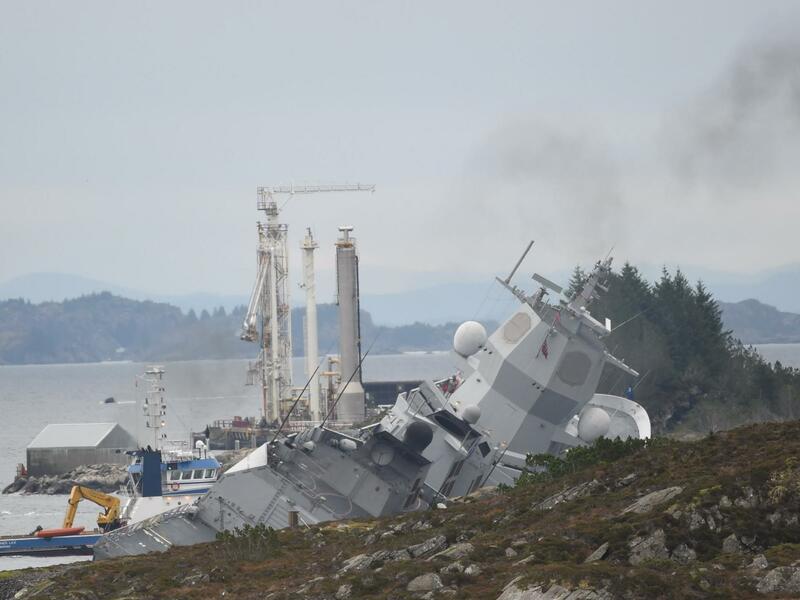 Now only the top of the vessel remains above water, in a major blow to Norway’s navy. The warship is designed to hunt enemy submarines. Sola TS, the oil tanker, has returned to port for inspection. It is understood to have been UK-bound at the time of the accident. A joint Norwegian and Maltese investigation into the cause of the crash is now underway. French President Emmanuel Macron openly rebuked US President Donald Trump’s political philosophy in Paris over the weekend. Trump returned to his old talking points— that the US is treated unfairly within NATO while maintaining trade deficits with those countries — as Macron talked up the idea of a European army that would in part serve to protect the continent from the US. In 2014, NATO countries agreed to raise their defense spending to 2% of gross domestic product by 2024. So far, only five countries — mainly in eastern and central Europe where the threat of Russia looms large — have met that pledge. Trump gave a speech to NATO members in Poland in July 2017 standing in front of a statue made of metal from the World Trade Center. Introduction Serbs migrated to the territories of modern Kosovo in the 7th century, but did not fully incorporate them into the Serbian realm until the early 13th century. The Serbian defeat at the Battle of Kosovo in 1389 led to five centuries of Ottoman rule, during which large numbers of Turks and Albanians moved to Kosovo. By the end of the 19th century, Albanians replaced the Serbs as the dominant ethnic group in Kosovo. Serbia reacquired control over Kosovo from the Ottoman Empire during the First Balkan War (1912), and after World War II (1945) the government of the Socialist Federal Republic of Yugoslavia led by Josip TITO reorganized Kosovo as an autonomous province within the constituent republic of Serbia. Over the next four decades, Kosovo Albanians lobbied for greater autonomy and Kosovo was granted the status almost equal to that of a republic in the 1974 Yugoslav Constitution. Despite the legislative concessions, Albanian nationalism increased in the 1980s leading to nationalist riots and calls for Kosovo’s independence. Serbs in Kosovo complained of mistreatment and Serb nationalist leaders, such as Slobodan MILOSEVIC, exploited those charges to win support among Serbian voters, many of whom viewed Kosovo as their cultural heartland. Under MILOSEVIC’s leadership, Serbia instituted a new constitution in 1989 that drastically curtailed Kosovo’s autonomy and Kosovo Albanian leaders responded in 1991 by organizing a referendum that declared Kosovo independent from Serbia. The MILOSEVIC regime carried out repressive measures against the Albanians in the early 1990s as the unofficial government of Kosovo, led by Ibrahim RUGOVA, tried to use passive resistance to gain international assistance and recognition of its demands for independence. In 1995, Albanians dissatisfied with RUGOVA’s nonviolent strategy created the Kosovo Liberation Army and launched an insurgency. In 1998, MILOSEVIC authorized a counterinsurgency campaign that resulted in massacres and massive expulsions of ethnic Albanians by Serbian military, police, and paramilitary forces. The international community tried to resolve the conflict peacefully, but MILOSEVIC rejected the proposed international settlement – the Rambouillet Accords – leading to a three-month NATO bombing of Serbia beginning in March 1999, which forced Serbia to withdraw its military and police forces from Kosovo in June 1999. UN Security Council Resolution 1244 (1999) placed Kosovo under a transitional administration, the UN Interim Administration Mission in Kosovo (UNMIK), pending a determination of Kosovo’s future status. Under the resolution, Serbia’s territorial integrity was protected, but it was UNMIK who assumed responsibility for governing Kosovo. In 2001, UNMIK promulgated a Constitutional Framework, which established Kosovo’s Provisional Institutions of Self-Government (PISG), and in succeeding years UNMIK increasingly devolved responsibilities to the PISG. A UN-led process began in late 2005 to determine Kosovo’s future status. Negotiations held intermittently between 2006 and 2007 on issues related to decentralization, religious heritage, and minority rights failed to yield a resolution between Serbia’s willingness to grant a high degree of autonomy and the Albanians’ call for full independence for Kosovo. On 17 February 2008, the Kosovo Assembly declared its independence from Serbia. History The formation of the Republic of Kosovo is a result of the turmoils of the disintegration of Yugoslavia, particularly the Kosovo War of 1996 to 1999, but it is suffused with issues dating back to the rise of nationalism in the Balkans under Ottoman rule in the 19th century, Albanian vs. Serbian nationalisms in particular, the latter notably surrounding the Battle of Kosovo eponymous of the Kosovo region. During the Neolithic period, the region of Kosovo lay within the extent of the Vinča-Turdaş culture. In the 4th to 3rd centuries BC, it was the territory of the Thraco-Illyrian tribe of the Dardani, forming part of the kingdom of Illyria. Illyria was conquered by Rome in the 160s BC, and made the Roman province of Illyricum in 59 BC. The Kosovo region became part of Moesia Superior in AD 87. The Slavic migrations reached the Balkans in the 6th to 7th century. The area was absorbed into the Bulgarian Empire in the 850s, where Christianity and Slavic culture was cemented in the region. It was re-taken by the Byzantines after 1018. As the center of Slavic resistance to Constantinople in the region, it often switched between Serbian and Bulgarian rule on one hand and Byzantine on the other until the Serb principality of Rascia conquered it by the end of the 11th century. Fully absorbed into the Serbian Kingdom until the end of the 12th, it became the secular and spiritual center of the Serbian medieval state of the Nemanyiden dynasty in the 13th century, with the Patriarchate of the Serbian Orthodox Church in Peć, while Prizren was the secular center. The zenith was reached with the formation of a Serbian Empire in 1346, which after 1371 transformed from a centralized absolutist medieval monarchy to a feudal realm. Kosovo became the hereditary land of the House of Branković and Vučitrn and Pristina flourished. In the 1389 Battle of Kosovo, Ottoman forces defeated a coalition led by Lazar Hrebeljanović. In 1402, a Serbian Despotate was raised and Kosovo became its richest territory, famous for mines. The local House of Branković came to prominence as the local lords of Kosovo, under Vuk Branković, with the temporary fall of the Serbian Despotate in 1439. During the first fall of Serbia, Novo Brdo and Kosovo offered last resistance to the invading Ottomans in 1441; in 1455, it was finally and fully conquered by the Ottoman Empire. Kosovo was part of the Ottoman Empire from 1455 to 1912, at first as part of the eyalet of Rumelia, and from 1864 as a separate province. Kosovo was briefly taken by the Austrian forces during the Great War of 1683–1699 with help of 6,000 led by Pjetër Bogdani. In 1690, the Serbian Patriarch of Peć Arsenije III led 37,000 families out of Kosovo. Other migrations of Orthodox Christians from the Kosovo area continued throughout the 18th century. In 1766, the Ottomans abolished the Patriarchate of Peć and the position of Christians in Kosovo deteriorated, including full imposition of jizya (taxation of non-Muslims). The final result of four and a half centuries of Muslim rule was a marked decline in the previously dominant Slavic Christian demographic element in Kosovo. In contrast, many Albanian chiefs converted to Islam and gained prominent positions in the Turkish regimen. On the whole, “Albanians had little cause of unrest” and “if anything, grew important in Ottoman internal affairs”, moving in to inhabit lands vacated by fleeing Christians. In the 19th century, Kosovo along with the rest of the Balkans saw an “awakening” of ethnic nationalism, in the case of Kosovo ethnic Albanian nationalism, including Romantic notions of ancient Illyria. In 1871, a Serbian meeting was held in Prizren at which the possible retaking and reintegration of Kosovo and the rest of “Old Serbia” was discussed, as the Principality of Serbia itself had already made plans for expansions towards Ottoman territory. In 1878, a Peace Accord was drawn that left the cities of Pristina and Kosovska Mitrovica under civil Serbian control, and outside Ottoman jurisdiction, while the rest of Kosovo remained under Ottoman control. As a response, ethnic Albanians formed the League of Prizren, pursuing political aspirations of unifying the Albanian people under the Ottoman umbrella. By the end of the 19th century the Albanians replaced the Serbs as the majority population people within what presently composes Kosovo and Metohija, though not the entire Ottoman Province. The Young Turk movement supported a centralist rule and opposed any sort of autonomy desired by Kosovars, and particularly the Albanians. In 1910, an Albanian uprising spread from Pristina and lasted until the Ottoman Sultan’s visit to Kosovo in June of 1911. In 1912, during the Balkan Wars, most of Kosovo was captured by the Kingdom of Serbia, while the region of Metohija (Albanian: Dukagjini Valley) was taken by the Kingdom of Montenegro. An exodus of the local Albanian population occurred. This was described by Leon Trotsky, who was a reporter for the Pravda newspaper at the time. The Serbian authorities planned a recolonization of Kosovo. Numerous colonist Serb families moved into Kosovo, equalizing the demographic balance between Albanians and Serbs. Kosovo’s status within Serbia was finalised the following year at the Treaty of London. In the winter of 1915-1916, during World War I, Kosovo saw a large exodus of the Serbian army which became known as the Great Serbian Retreat, as Kosovo was occupied by Bulgarians and Austro-Hungarians. In 1918, the Serbian Army pushed the Central Powers out of Kosovo. After World War I ended, the Monarchy was then transformed into the Kingdom of Serbs, Croats and Slovenians on 1 December 1918. The 1918–1929 period of the Kingdom of Serbs, Croats and Slovenians witnessed a rise of the Serbian population in the region. Kosovo was split into four counties, three being a part of Serbia (Zvečan, Kosovo and southern Metohija) and one of Montenegro (northern Metohija). However, the new administration system since 26 April 1922 split Kosovo among three Areas of the Kingdom: Kosovo, Rascia and Zeta. In 1929, the Kingdom was transformed into the Kingdom of Yugoslavia and the territories of Kosovo were reorganised among the Banate of Zeta, the Banate of Morava and the Banate of Vardar. The Kingdom of Yugoslavia lasted until the World War II Axis invasion of 1941, when the greatest part of Kosovo became a part of Italian-controlled Albania, and smaller bits by the Tsardom of Bulgaria and German-occupied Military Administration of Serbia. After numerous uprisings of Partisans led by Fadil Hoxha, Kosovo was liberated after 1944 with the help of the Albanian partisans of the Comintern, and became a province of Serbia within the Democratic Federal Yugoslavia. The province was first formed in 1945 as the Autonomous Kosovo-Metohian Area to protect its regional Albanian majority within the People’s Republic of Serbia as a member of the Federal People’s Republic of Yugoslavia under the leadership of the former Partisan leader, Josip Broz Tito. After Yugoslavia’s name change to the Socialist Federal Republic of Yugoslavia and Serbia’s to the Socialist Republic of Serbia in 1953, Kosovo gained limited internal autonomy in the 1960s. In the 1974 constitution, the Socialist Autonomous Province of Kosovo’s government received more powers, including the highest governmental titles – President and Prime Minister and a seat in the Federal Presidency which made it a de facto Republic within the Federation, but remaining a Socialist Autonomous Province within the Socialist Republic of Serbia. (Similar rights were extended to Vojvodina). In Kosovo Serbo-Croatian, Albanian and Turkish were defined as official languages on the provincial level. The ethnic balance of Kosovo tilted as the number of Albanians tripled, rising from almost 75% to over 90%, but the number of Serbs barely increased, dropping from 15% to 8% of the total population. Even though Kosovo was the least developed area of the former Yugoslavia, the living and economic prospects and freedoms were far greater than under the totalitarian Hoxha regime in Albania. Beginning in March 1981, Kosovar Albanian students organized protests seeking that Kosovo become a republic within Yugoslavia. During the 1980s, ethnic tensions continued with frequent violent outbreaks against Serbs and Yugoslav state authorities resulting in increased emigration of Kosovo Serbs and other ethnic groups. The Yugoslav leadership tried to suppress protests of Kosovo Serbs seeking protection from ethnic discrimination and violence. Inter-ethnic tensions continued to worsen in Kosovo throughout the 1980s. The 1986 SANU Memorandum warned that Yugoslavia was suffering from ethnic strife and the disintegration of the Yugoslav economy into separate economic sectors and territories, which was transforming the federal state into a loose confederation. On June 28, 1989, Milošević delivered a speech in front of a large number of Serb citizens at the main celebration marking the 600th anniversary of the Battle of Kosovo, held at Gazimestan. Many think that this speech helped Milošević consolidate his authority in Serbia. In 1989, Milošević, employing a mix of intimidation and political maneuvering, drastically reduced Kosovo’s special autonomous status within Serbia. 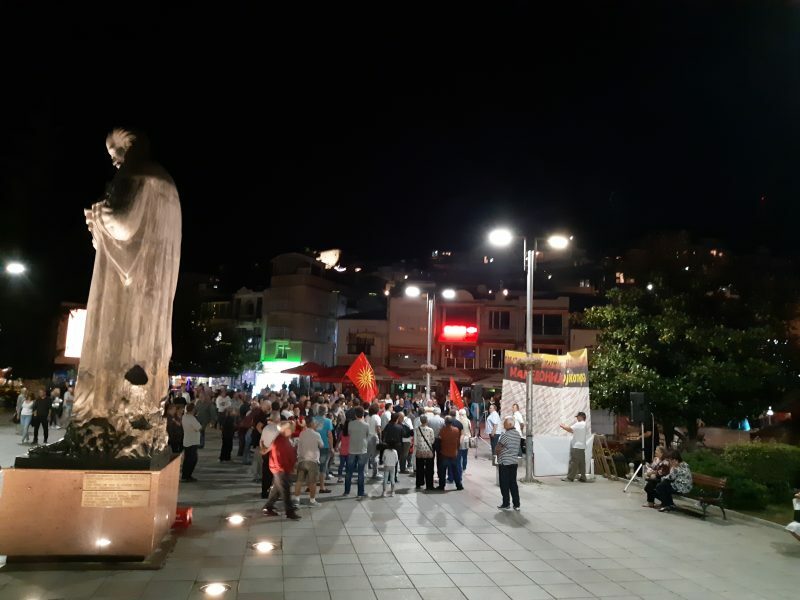 Soon thereafter, Kosovo Albanians organized a non-violent separatist movement, employing widespread civil disobedience, with the ultimate goal of achieving the independence of Kosovo. On July 2, 1990, an unconstitutional Kosovo parliament declared Kosovo an independent country, the Republic of Kosova. The Republic of Kosova was formally disbanded in 2000 when its institutions were replaced by the Joint Interim Administrative Structure established by the United Nations Interim Administration Mission in Kosovo (UNMIK). During its lifetime, the Republic of Kosova was only recognized by Albania. The Kosovo War was initially a conflict between Serbian and Yugoslav security forces and the Kosovo Liberation Army (KLA), an ethnic Albanian guerrilla group identified by some as terrorist., seeking secession from the former Yugoslavia. In 1998, Western interest had increased and the Serbian authorities were compelled to sign a unilateral cease-fire and partial retreat. Under an agreement devised by Richard Holbrooke, OSCE observers moved into Kosovo to monitor the ceasefire, while Yugoslav military forces partly pulled out of Kosovo. However, the ceasefire was systematically broken shortly thereafter by KLA forces, which again provoked harsh counterattacks by the Serbs. The Serbs then began to escalate the conflict, using military and paramilitary forces in another ethnic cleansing campaign this time against the Kosovar Albanians. An estimated 300,000 refugees were displaced during the winter of 1998, many left without adequate food or shelter, precipitating a humanitarian crisis and calls for intervention by the international community. NATO intervention between March 24 and June 10, 1999, combined with continued skirmishes between Albanian guerrillas and Yugoslav forces resulted in a massive displacement of population in Kosovo. During the conflict, roughly a million ethnic Albanians fled or were forcefully driven from Kosovo. Altogether, more than 11,000 deaths have been reported to Carla Del Ponte by her prosecutors. Some 3,000 people are still missing, of which 2,500 are Albanian, 400 Serbs and 100 Roma. After the war ended, the UN Security Council passed Resolution 1244 that placed Kosovo under transitional UN administration (UNMIK) and authorized KFOR, a NATO-led peacekeeping force. Resolution 1244 also delivered that Kosovo will have autonomy within Federal Republic of Yugoslavia (today legal successor of Federal Republic of Yugoslavia is Republic of Serbia). Some 200,000-280,000, representing the majority of the Serb population, left when the Serbian forces left. There was also some looting of Serb properties and even violence against some of those Serbs and Roma who remained. The current number of internally displaced persons is disputed, with estimates ranging from 65,000 to 250,000. Many displaced Serbs are afraid to return to their homes, even with UNMIK protection. Around 120,000-150,000 Serbs remain in Kosovo, but are subject to ongoing harassment and discrimination. According to Amnesty International, the aftermath of the war resulted in an increase in the trafficking of women for sexual exploitation. In 2001, UNMIK promulgated a Constitutional Framework for Kosovo that established the Provisional Institutions of Self-Government (PISG), including an elected Kosovo Assembly, Presidency and office of Prime Minister. Kosovo held its first free, Kosovo-wide elections in late 2001 (municipal elections had been held the previous year). In March 2004, Kosovo experienced its worst inter-ethnic violence since the Kosovo War. The unrest in 2004 was sparked by a series of minor events that soon cascaded into large-scale riots. International negotiations began in 2006 to determine the final status of Kosovo, as envisaged under UN Security Council Resolution 1244. The UN-backed talks, lead by UN Special Envoy Martti Ahtisaari, began in February 2006. Whilst progress was made on technical matters, both parties remained diametrically opposed on the question of status itself. In February 2007, Ahtisaari delivered a draft status settlement proposal to leaders in Belgrade and Pristina, the basis for a draft UN Security Council Resolution which proposes ‘supervised independence’ for the province. A draft resolution, backed by the United States, the United Kingdom and other European members of the Security Council, was presented and rewritten four times to try to accommodate Russian concerns that such a resolution would undermine the principle of state sovereignty. Russia, which holds a veto in the Security Council as one of five permanent members, had stated that it would not support any resolution which was not acceptable to both Belgrade and Kosovo Albanians. Whilst most observers had, at the beginning of the talks, anticipated independence as the most likely outcome, others have suggested that a rapid resolution might not be preferable. After many weeks of discussions at the UN, the United States, United Kingdom and other European members of the Security Council formally ‘discarded’ a draft resolution backing Ahtisaari’s proposal on 20 July 2007, having failed to secure Russian backing. Beginning in August, a “Troika” consisting of negotiators from the European Union (Wolfgang Ischinger), the United States (Frank Wisner) and Russia (Alexander Botsan-Kharchenko) launched a new effort to reach a status outcome acceptable to both Belgrade and Pristina. Despite Russian disapproval, the U.S., the United Kingdom, and France appeared likely to recognize Kosovar independence. A declaration of independence by Kosovar Albanian leaders was postponed until the end of the Serbian presidential elections (4 February 2008). Most EU members and the US had feared that a premature declaration could boost support in Serbia for the ultra-nationalist candidate, Tomislav Nikolić. The Kosovar Assembly approved a declaration of independence on 17 February 2008. Over the following days, several countries (the United States, Turkey, Albania, Austria, Germany, Italy, France, the United Kingdom, Republic of China (Taiwan), Australia and others) announced their recognition, despite protests by Serbia in the UN Security Council. The UN Security Council remains divided on the question (as of 25 February 2008). Of the five members with veto power, USA, UK, and France recognized the declaration of independence, and Russia and the People’s Republic of China consider it illegal. As of 28 March 2008, no member-country of CIS, CSTO or SCO has recognized Kosovo as independent. The European Union has no official position towards Kosovo’s status, but has decided to deploy the European Union Rule of Law Mission in Kosovo to ensure a continuation of international civil presence in Kosovo. As of today, most of member-countries of NATO, EU, WEU and OECD have recognized Kosovo as independent. Of Kosovo’s immediate neighbour states (other than Serbia), only Albania recognizes the declaration of independence. Croatia, Bulgaria and Hungary, all neighbours of Serbia, announced in a joint statement that they would also recognise the declaration. Politics The largest political party in Kosovo, the Democratic League of Kosovo (LDK), has its origins in the 1990s non-violent resistance movement to Miloševic’s rule. The party was led by Ibrahim Rugova until his death in 2006. The two next largest parties have their roots in the Kosovo Liberation Army (KLA): the Democratic Party of Kosovo (PDK) led by former KLA leader Hashim Thaci and the Alliance for the Future of Kosovo (AAK) led by former KLA commander Ramush Haradinaj. Kosovo publisher Veton Surroi formed his own political party in 2004 named “Ora.” Kosovo Serbs formed the Serb List for Kosovo and Metohija (SLKM) in 2004, but have boycotted Kosovo’s institutions and never taken their seats in the Kosovo Assembly. In November 2001, the OSCE supervised the first elections for the Kosovo Assembly. After that election, Kosovo’s political parties formed an all-party unity coalition and elected Ibrahim Rugova as President and Bajram Rexhepi (PDK) as Prime Minister. After Kosovo-wide elections in October 2004, the LDK and AAK formed a new governing coalition that did not include PDK and Ora. This coalition agreement resulted in Ramush Haradinaj (AAK) becoming Prime Minister, while Ibrahim Rugova retained the position of President. PDK and Ora were critical of the coalition agreement and have since frequently accused the current government of corruption. Parliamentary elections were held on 17 November 2007. After early results, Hashim Thaçi who was on course to gain 35 per cent of the vote, claimed victory for PDK, the Albanian Democratic Party, and stated his intention to declare independence. Thaci is likely to form a coalition with current President Fatmir Sejdiu’s Democratic League which was in second place with 22 percent of the vote. The turnout at the election was particularly low with most Serbs refusing to vote. When Greece, traditionally among Russia’s closest friends in Europe, expelled two Russian diplomats last month for trying to wreck a deal with the neighboring Republic of Macedonia, it exposed Moscow’s deepening frustration at President Vladimir Putin’s loss of influence in a key strategic region. Russia’s being squeezed out of the Balkans by the expansion of the European Union and the North Atlantic Treaty Organization, leaving the Kremlin with diminishing clout in southeastern Europe. There’s little chance of reversing that trend, according to four people in Moscow familiar with its Balkans policy. “NATO membership of course is bad for us,” said Leonid Reshetnikov, a former head of Russian foreign intelligence who also served as an agent in Greece and the Balkans. “What can we do? They are clearing this territory” of rival influences, he said. Russia’s deep historical and cultural ties to the Balkans made the region a preserve of pro-Moscow sentiment that ensured warmer relations than with much of the rest of Europe. Now Balkan states are becoming bound in with the West as they gravitate toward the EU and NATO. Even amid divisions within the EU and questions raised by President Donald Trump about the US commitment to its NATO allies, the blocs still exert a strong pull in the region with their promises of rising trade and living standards, strengthened rule of law and security guarantees. Russia’s shrinking geopolitical reach is a historic setback for Putin, even as the Kremlin leader’s global power appears to be on the march, from Syria to meddling in US politics. Russia on Monday summoned the Greek ambassador to inform him that the foreign ministry was retaliating with reciprocal diplomatic measures in response to the expulsions. Under the deal with Athens, the Republic of Macedonia will become the Republic of North Macedonia after Greece objected that the former Yugoslav republic’s title implied a territorial claim on its province with the same name. 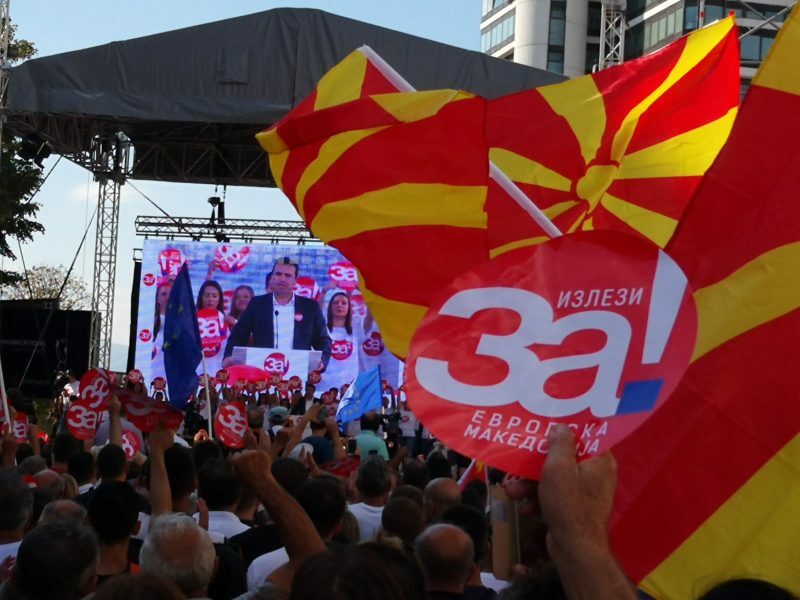 The Republic of Macedonia plans to hold a referendum on Sept. 30. The deal is opposed by President Gjorge Ivanov, while Prime Minister Zoran Zaev has accused unnamed Greek businessmen sympathetic to Russia of inciting protests against it. Last month, the Organized Crime and Corruption Reporting Project, a consortium of investigative reporters, cited the Republic of Macedonia’s Interior Ministry documents as saying that Greek-Russian billionaire Ivan Savvidis paid 300,000 euros to opponents of the accord. A representative for Savvidis denied the claim. The former Yugoslav republic “will be in NATO,” said Frants Klintsevich, a member of the defense and security committee in Russia’s upper house of parliament. Moscow views the expansion of the alliance as reinforcing “the circle of enemies around Russia,” he said. The tensions follow accusations by Montenegro that Russia was behind a failed coup attempt during 2016 parliamentary elections in a bid to derail its entry into the U.S.-led military alliance last year. Two Russian intelligence officers are among 14 people charged with the plot by Montenegrin prosecutors. Russia denies any involvement. Konstantin Malofeev, a wealthy Russian businessman and Putin ally, who’s been sanctioned by the EU for backing insurgents in eastern Ukraine and has cultivated links to far-right parties in Europe, warned ominously of a backlash in Greece. A June opinion poll in Greece showed almost 70 percent of Greeks opposed the agreement with the Republic of Macedonia. Russia’s sometimes heavy-handed efforts to stem the West’s growing influence have provoked alarm, particularly after the 2014 annexation of Crimea and support for rebels fighting in eastern Ukraine. Moscow’s fear is that it may be left without partners in the region. Albania and Croatia are NATO members, while Bosnia and Herzegovina says it wants to join, though Bosnian Serbs with ties to Russia threaten to block any attempt. Even Russia’s closest regional ally, Serbia, has joined NATO’s Partnership for Peace cooperation program. Meanwhile, the EU has dangled the prospect of membership as early as 2025 for Serbia and five other Balkans states. Ranged against Russia are the US and its European allies. US Vice President Mike Pence spoke by phone to Tsipras and Zaev on July 5. He later tweeted that “successful implementation’’ of the agreement “will open the door to European integration’’ for the Republic of Macedonia. German Foreign Minister Heiko Maas said July 30 that it’s in the EU’s “strategic interest” to expand into the western Balkans. Three Czech service members with NATO’s Resolute Support mission were killed Sunday in eastern Afghanistan by a suicide bomber, the U.S. military and Czech authorities said. The Czech Republic “had recently approved a plan to deploy 390 soldiers in Afghanistan through 2020, up from the current 230,” as part of NATO’s Resolute Support mission, according to The Associated Press. “My thoughts and prayers, along with those of all of the 41 Resolute Support nations, are with the families and friends of our fallen and wounded service members, and our injured Afghan brothers and their families,” U.S. Army Gen. John Nicholson, the commander of U.S. Forces-Afghanistan, said in a statement. The Taliban claimed responsibility, Reuters reported, and claimed to have killed “eight U.S. invaders in a tactic bombing,” according to a spokesperson quoted by the wire service. The bombing happened in the area of Charakar, in the east of the country and north of Kabul, according to reports. Separately, The Associated Press reports the Taliban attacked a district headquarters in Afghanistan’s Uruzgan province Saturday, killing four Afghan soldiers, while nine Taliban fighters died in a gunfight with Afghan soldiers. ISIS affiliates have also continued to carry out deadly attacks in Afghanistan. ISIS claimed responsibility this weekend for a Friday attack on a Shiite mosque in Afghanistan’s Paktia province that killed at least 29 people and injured at least another 80 people, according to reports. NATO describes the Resolute Support mission as “a NATO-led, non-combat mission to train, advise and assist the Afghan National Defense and Security Forces (ANDSF).” The organization says the current mission includes about 16,000 personnel. NATO formally ended its main combat mission against the Taliban in Afghanistan in 2014. As of almost a year ago, the U.S. military reported having 13,329 uniformed American forces in Afghanistan, but has since stopped providing troop numbers.